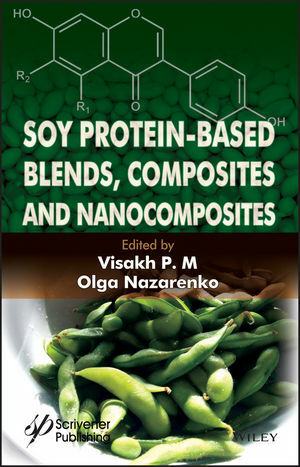 This book discusses soy protein nanoparticle-based polymer blends, composites and nanoconposites aling with their chemistry, processing, preparation, characterization, applications as well as the soy protein-based materials rheology. After discussing the preparation of soy protein nanoparticles, the characterization methods such as atomic force microscope (AFM), transmission electron microscope (TEM) and scanning electron microscope (SEM), for the nanoscale soy protein reinforcements are examined. The various processing methods for nanocomposites and their mechanical, thermal properties, barrier properties are then discussed. The book then moves on to discussing the different types of blends, composites and nanocomposites with their type of polymer matrixes such as thermoplastics, thermoset, natural rubbers and synthetic rubbers. Visakh P. M is working as post doc. researcher at Tomsk Polytechnic University, Russia. He obtained his PhD, MPhil and MSc degrees from the School of Chemical Sciences, Mahatma Gandhi University, Kottayam, Kerala, India. He has edited 15 books for a variety of international publishers and has been a visiting researcher in many countries since 2011. His research interests include polymer nanocomposites, bio-nanocomposites and rubber based nanocomposites, fire retardant polymers, liquid crystalline polymers and silicon sensors. Olga Nazarenko obtained her PhD in Technical Sciences from Tomsk Polytechnic University, Russia where she is now a Professor in the Ecology and Basic Safety Department. In 2007 she obtained her DSc. in Processes and Apparatus of Chemical Technology. She has 170 publications, 3 books and 8 textbooks and 7 patents to her credit.